What are some, if not the best bluegill bait to use for catching these little powerhouse panfish? Bluegills will bust on nearly any kind of bait that you toss out, within obvious reasons of course, but what do these sunfish prefer to eat? Most new comers to freshwater fishing will think "hook, line and sinker," and use a nightcrawler worm as bait. Toss it out and hope that something hits it... "yeah, chew on this sucka." When fishing for bluegill, that will pretty much get the job done as long as you put it in the right spot. But I suppose that can go without saying for most species of fish as well. Well, let's take a look into the variety of foods that bluegill feed on. The following information will give you a greater idea about what types of bluegill bait you may want to consider selecting for even more successful freshwater fishing outings on the water. You may choose to experiment fishing with some, or keep it simple with just a couple of the sure go-to types of baits for bluegills. We already covered night crawlers, in a nut shell. You may want to pinch off the bottom ends of the worms so that they aren't dangling too much from the hook, otherwise the bluegill are capable of short biting and stealing your bait. Worms of just about any kind should be efficient. I also like using the small blood worms and pan fish style trout worms. There's also wax worms, meal worms, and another favorite of mine, red wigglers. Insects and bugs are some other types of things they are known to munch on. From crickets, grasshoppers, water beetles, dragonflies, goldenrod gall moth grubs and other types of larvae. At night, you may find bluegill feeding on the bugs that have been attracted towards an artificial light resource near the water. Bluegill, especially the big bluegill fish, enjoy ambushing prey of bait fish, especially small minnows. 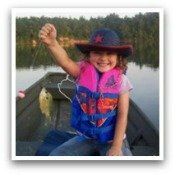 Therefore, small minnows from 1 to 2 inches would be an excellent choice of bluegill bait. Also crustaceans such as crayfish and freshwater shrimp make for some sweet and appetizing meals for bluegill. Not only can you catch bluegill with bait, you can use bluegill as bait. Of course, as long as it's legal in the particular body of water you are fishing. Just be sure to check your local laws and regulations before doing so. Bluegill are a great bait for largemouth bass, striped bass and catfish. As a matter of fact, Manabu Kurita caught a bluegill and used it as bait to land the behemoth world record bass that put his name in the record books as a shareholder along side with George Perry's world record largemouth bass for the heaviest largemouth bass ever caught.